Last weekend I was reading Burkatron, one of my new favourite blogs (if you haven't subscribed yet, do it! 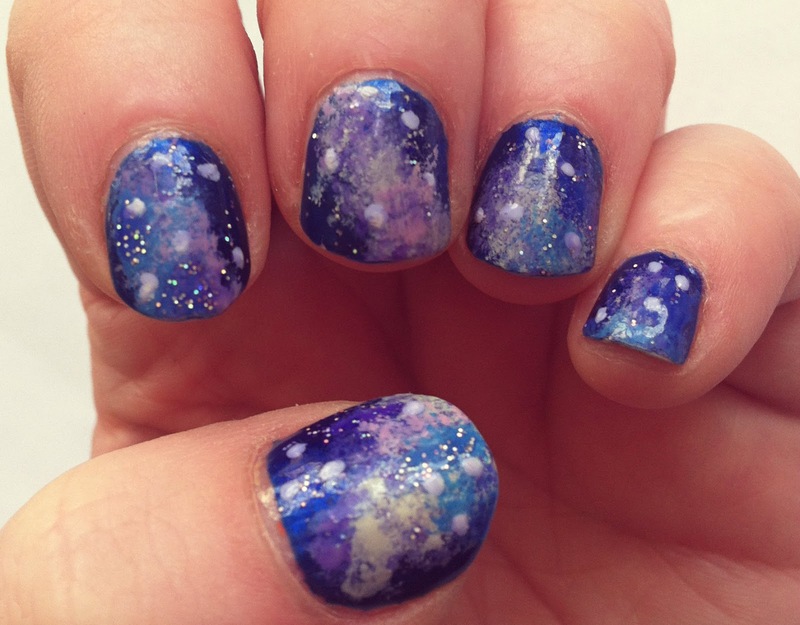 ), & I spotted her tutorial for galaxy nail art. It had been absolutely ages since I last tried this so I thought I'd give it a go! It's a really simple tutorial - you just paint your nails a dark base colour (I had no black polish, so I used Crayola's dark blue) and randomly sponge lighter colours all over your nails. I used a mixture of yellow, light blue, purple and turquoise (all Model's Own polishes). Then you add in random white dots (to make stars), use a little bit of glitter & seal with a top coat. Some nails are better than others, but overall I'd say it's a huge improvement on my last attempt (look how short my nails are! & how bad my photo is! Sorry older readers..!). My nails are in a bit of a state at the moment, they are all different lengths and just feeling a bit knackered (if er, nails can be knackered). A proper beauty blogger I am not. love the galaxy nail look. so dreamy! wow these look amazing, I'm rubbish at nail art! !